I recently re-connected with my maternal biological family after being adopted when I was a baby. In doing so, I’ve been sharing with them bits about my life growing up in Baltimore– the good, the bad, and the ugly. In reconnecting with this part of my family, I have definitely reconnected with a part of myself that was birthed and cultivated in Baltimore– a tough gritty edginess that can only be explained by my experiences growing up in this city. Realizing this has made me appreciate and value the beauty in the harsh, sometimes dangerous, realities that I experienced growing up there because it is still part of me. This has definitely been a big shift for me, because I never really embraced these hard components of my childhood up until this point. At the invitation of a friend, I recently visited Jordan Faye Contemporary, who just opened a new art gallery location within the Bromo Arts District of Baltimore. The True Grit exhibit, curated by Jonathan Hanson, was a collection of photographs capturing Baltimore from a street level view. As I toured the exhibit, I could really relate to the images as pieces of my childhood and teen years. As I viewed the photographs, all I could think was, “This is so Baltimore.” I had three favorite photographs that really resonated with me. So to commemorate this monumental time in my life, I purchased all of them and took them home with me as the start of my personal art collection. The first was a photo of a girl holding her doll which truly embodied all of the little girls I grew really close to during my years as a volunteer in an inner-city after-school reading program off of Orleans and as a girls mentor and Sunday school teacher at my family’s Highlandtown church. So beautiful and emotional for me, that I definitely got a little teary-eyed the first time I saw it. The little boy with the gun in the background reminded me of a bittersweet moment when I confiscated a concealed “razor knife” all the girls were up-in-arms over that one of their 4 year old little brothers was packin one day. I had to hold back a smirk when it turned out to be only a metal nail file. He was still convinced it was a piece of badass contraband as he reluctantly unveiled it from his pocket. I didn’t tell him otherwise. I gave him a stern lecture about our no-weapon policy and tucked the lethal weapon in my desk for safekeeping. This little girl also really embodied me as a little girl–growing up in Baltimore. I felt like I was looking at a picture of my younger self. I just wanted to scoop her up and let her know she was gonna be okay, and that she was going to grow up to be a fine young woman, and that all of the hardships she would ever face would only reinforce her strength. I really connected with the Highlandtown photo because I spent most of my childhood and teen years romping around Highlandtown, like attending Highlandtown Elementary #215. Even when my family moved to “the county” when I was 10 years old, we still had a Highlandtown zip code and still lived along Eastern Avenue until I was 18. The photo looks exactly like the alley of the home on Robinson Street where I used to ride my little red scooter and where I left it propped up against the back gate. In this house, my mom and I loved walking down the street to the Patterson Park movies and visiting the local Chinese food joint for some of the most amazing shrimp fried rice and a 25-cent game of Pac-Man. Simple pleasures. Fond memories. My Polish-German family and my husband’s Greek family both lived in Highlandtown, too. The photo brought back a lot of great memories of time with my polish grandparents, like hand-churning seasoned ground meat into homemade kielbasa for sauerkraut for the holidays in the summer kitchen of my grandma’s row home and hula-hooping outside of her home’s big bright-red brick steps and classic Charm City stained-glass windows. The photo also reminded me of my husband’s Greek heritage, including walking past his yiayia’s Greek Orthodox church, St. Nicholas, and going to Ikaros for their amazing lump crab cakes and traditional lemon soup. Yiayia and my husband’s mom immigrated to Greektown in Baltimore after coming to the US, literally on a boat to New York. One of her remarkable memories was penning live lambs in the backyards of their rowhomes in Greektown for the slaughter at Easter. Thankfully this is now illeagal, in case you were wondering. Such beautiful and rich family history, though. I love that I will be able to share this photo with my future children and their children’s children. It’s such a timeless photo. The third photo of the Stoop was really impacting and incredibly powerful. Every time I looked at it, I was instantly transported to Baltimore in a completely visceral way– so much so, it gave me chills. There is a rawness and a toughness about Baltimore that is beautifully captured in this photo. I believe that Baltimore is a pivotal city not only for the US, but in the world at large. I think that sometimes Baltimore as a city is its own worst enemy–always thinking that it can’t be good enough. As if it can never be as influential as NY or LA, or anywhere abroad. I personally felt the weight of that when I lived there. I think that the tides are turning though, and I think that Baltimore is coming into its own as the years pass. It’s funny, I feel like Baltimore is “growing up” as a city in the same way I have been growing up as an individual. From humble working class beginnings, its learning to have a voice. Its figuring out who it is and who it is meant to be. Its finding its space in the world. It’s learning how to be tough and vulnerable at the same time. It’s learning how beautiful it is to be real and its embracing that. For me, this photo highlights transition, change, and growth in the city. I believe that Baltimore is a total game-changer—not only for the US, but for the world at large. In order for true revloutionary change to occur, old walls have to be broken down. I would love to see some of the hard walls of my rough hometown destroyed. And seeing the rubble of a fortified brick building torn down in this photo gives me hope that things like racial tension, fatherlessness, and violence in the city can also be demolished so that Baltimore can truly thrive. And once it does, look out! The repercussions will be limitless. So, for me, this photo was actually remarkably hopeful, not to mention beautifully shot. Coming to this exhibit was almost cathartic –providing closure to old memories that have been resurfacing for me. It has also given me inspiration for a new direction on a book project I am working on to share my life experiences– not only as a Korean adoptee into a Caucasian family, but as a true Baltimore native. 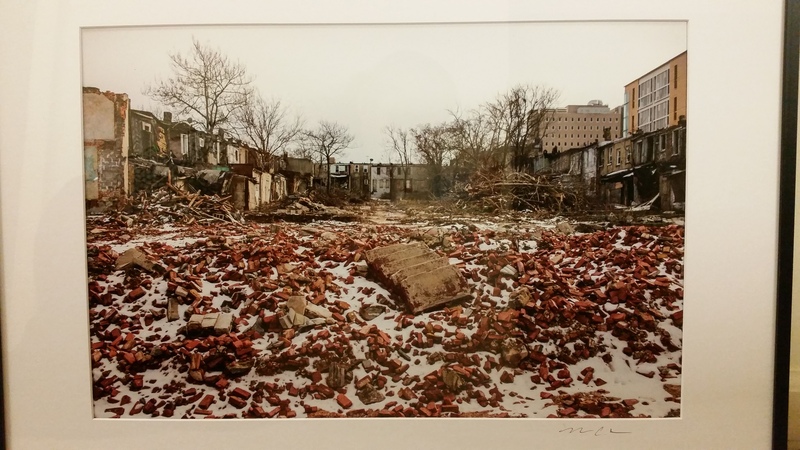 The art featured in this post included “South Baltimore” photographed by Jennifer Bishop, “Highlandtown” photographed by Brian Miller and “The Stoop” photographed by Matt Roth. If you would like to become more connected with the growing art community in Baltimore, check out www.jordanfayecontemporary.com and www.fullcirclephoto.com, or follow any of these amazing artists.